This wonderul women’s sea jasper gemstone pendant has been lovingly handcrafted in our studio as part of our 925 Silver and Back to Nature ranges. 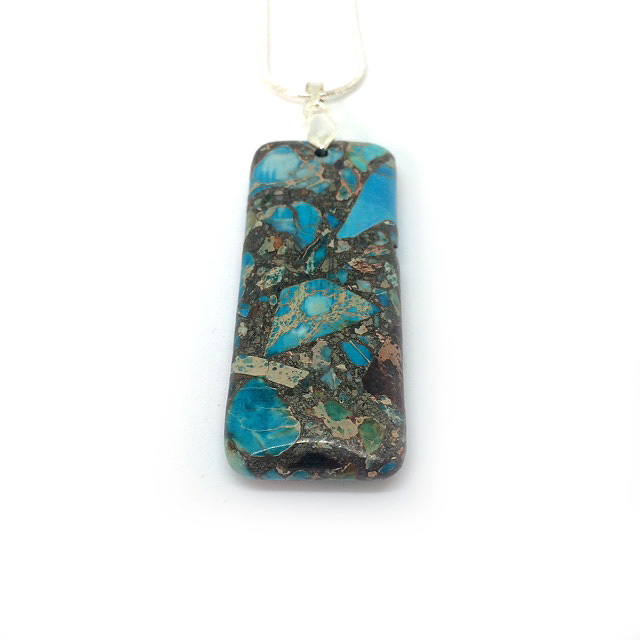 It features a charming natural sea jasper gemstone in a beautifully unique pattern of sky blue and neutral colours. Finished off with a quality Sterling Silver snake chain and bail, this necklace measures approximately 18″ (with the jasper gemstone measuring approximately 2″). It looks great day or night and makes the ideal gift for her, whatever the occasion. Our Sterling Silver collection features a range of natural agate gemstones in two different chain lengths and an array of beautiful colours and patterns. Please note that as these are natural gemstones, colours may vary slightly. All of our products are designed and handcrafted in the UK and we use only the highest quality materials, crystals and gemstones. All of our jewellery is supplied in an attractive gift box. Here's your new product tab. At Luxiere, our jewellery is made for individuality that's why we think it is important that your item of jewellery has the perfect fit, that's why we have provided the below Jewellery Sizing Guide. Although our pieces are made to standard UK sizes we can also customise your item of jewellery to your desired size*. Men's bracelet: 8" – 9"
Men's: between 8" and 9"
Women's collar: 12" to 13"
Women's choker: 14" to 16"
Women's princess: 17" to 19"
Women's matinee: 20" to 24"
Women's opera: 28" to 34"
If you have any questions regarding jewellery sizing, please contact us. *Please note, that customised items will be tailored at time of order, which can take up to 7 days from order date to be shipped. Join us for exclusive discounts, offers & competitions!